Coronado CARES is dedicated to the protection and humane treatment of cats. Coronado CARES is an advocate for feral cats through the Trap-Neuter-Return (TNR) Program. A feral cat is a cat that is not used to human touch. Feral cats can be kittens that have been born and grown up in the wild without human contact or they are cats that have been abandoned by humans and have adapted to living on their own in the wild. The TNR Program involves trapping feral cats, taking them to the veterinarian for spaying/neutering and then returning them to the location where they were trapped. 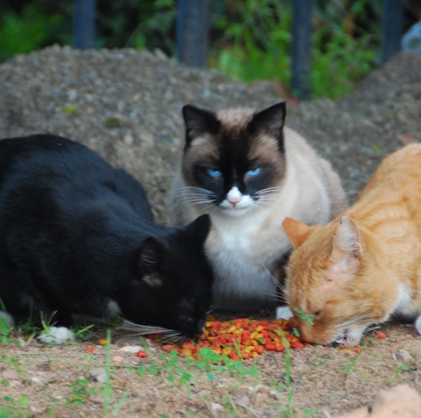 Volunteers feed the feral cats on a daily basis. Volunteers not only feed the feral cats, they check them for health issues and they check to see if new cats are coming for food. Some feral cats live in groups, which we call a colony. Other feral cats live alone. If a new cat is spotted, it will be checked for an identification tag or a microchip. It may be a cat that someone abandoned or it might be a cat that has gotten lost from its owner. If it is truly a feral cat, then it will be trapped, spayed or neutered and returned to the location where it was found. Cats can become pregnant as young as four months old and can have as many as three litters of kittens per year. One unsprayed female cat and her unsprayed kittens can produce over 11,000 cats in five years. There simply are not enough homes for all of these cats. The humane thing to do is to spay and neuter the feral cats so that with time there will be no more homeless cats. The TNR Program helps to stabilize the feral cat population. Through spaying/neutering the feral cats, no more kittens are born in the “wild” where they will not get homes and the spayed and neutered feral cats live healthy lives. Feral cats are just as healthy as domesticated house cats. They are no more likely to get infected with diseases than house cats – your own pet kitties. Coronado CARES receives numerous phone calls from the public regarding stray cats in their neighborhood. Volunteers help resolve the issues with stray and feral cats in neighborhoods through conversations and educational brochures. More than 70% of feral cats that enter our nation’s animal control pounds and shelters are killed annually. It is in-humane to kill innocent cats and kittens that have been abandoned by people. This is a huge expense to our cities. There is a solution to this problem. If we have active TNR Programs in our communities we can stop the massive reproduction of cats. Cats provide a service through the ecosystem. They help control the rodent population. When feral cats are spayed or neutered, and returned to their home in the wild they provide a service to the community.